Is there a Mrs. Super-Villian? Despicable Me, Universal Studios’ animated summer entry, seems as though it should be rebranded Unlucky Me by having the misfortune of being released while the superb and superior Toy Story 3 is still filling theaters. Trying to summarize the plot suggests part of Despicable Me’s problem. Gru (voiced by Steve Carell) is a megalomaniacal, past-his-prime professional villain who cuts in line at coffee shops and rumbles around down in a gargantuan, environmentally unfriendly tank. Gru also desperately yearns to get back into the dastardly deeds game by heisting the moon. So, he adopts a trio of pint-sized orphaned sisters selling scout cookies in order to help him pilfer a shrink ray off Vector (Jason Segal), a geeky, tracksuit-wearing rival baddie. Got it? Beyond the strained storytelling – think Annie meets Dr. Evil – the entire setup smacks of contrivance. Beginning with Carell’s overcooked Eastern European brogue, there are also uneven, ethereal 3-D visuals (the product of a French animation house), an original, ill-fitting soundtrack by hip hop producer Pharrell Williams, and Gru’s throng of pill-shaped yellow Minions, who go off on their own misadventures and whose ultimate purpose is to serve as the film’s marketing face in lieu of the less cuddly Gru. The voice actors – Russell Brand, Julie Andrews, Miranda Cosgrove (iCarly) – are brand-name but virtually unrecognizable, which usually means they are misused. Still, Despicable Me remains carefree enough, especially for its younger target audience. The filmmakers’ keen sense of comic timing aids many of its sight gags, and make sure you don’t watch the 3-D enhanced roller coaster sequence on a full stomach. I chuckled that the only person more sinister than a super-villain is a loan officer at the Bank of Evil (“formerly Lehman Brothers,” says its marquee). 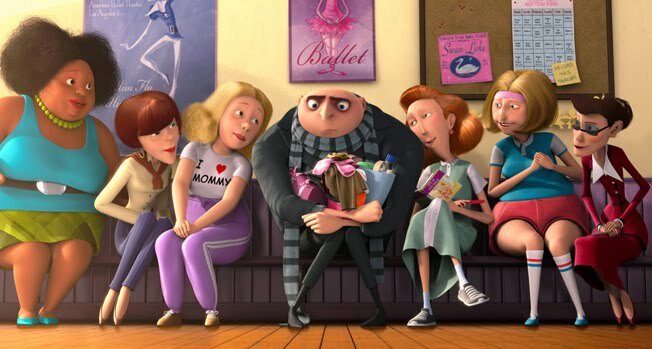 And, the film hoists up enough semi-credible, late-game moral lessons to preserve a semblance of integrity, although the notion that the girls will eventually thaw Gru’s heart is as predictable as squealing preteens at a Twilight screening. Despicable Me is light, mildly entertaining, and entirely forgettable – think of it as the anti- Toy Story 3. Funny thing, for your average summertime kids’ diversion, that might just be enough.